Celebrating God's Incredible Love for You! If you liked God's Little Princess Devotional Bible and Sweet Dreams Princess, then you'll love I am Loved! 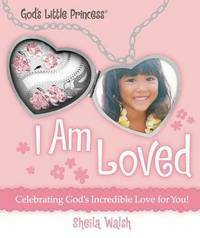 International Children's Bible passages are accompanied by promises, praises, prayers, application, and reflection that help little girls learn about God and His incredible love for them. The focus is on getting to know the One who made you - our King! Every little girl is special, and here's a way to help them learn this for themselves. Sections include: Livin' the Princess Life (How to live life according to God's Word), Royal Connections (How to live life with love and compassion), Faithful Love (Learn to trust Him), Perfect Princess Praise (Learn toworship Him in everything), PreciousPromises (Reassurance of God's promises), and Crafts, Games and Recipes.